Video poker gambling looks like slot machine gambling, but it’s better in almost every way I can imagine. Even if you’re not good at video poker strategy, the payback percentage on a video poker machine is almost always better than the payback percentage on a slot machine. And if you’re willing to invest a little bit of time and common sense into learning real video poker strategy, you can see payback percentages of over 99%, which makes video poker one of the best games in the casino for the gambler. 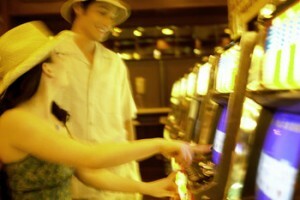 It’s a slot machine type game that simulates poker, only it’s played on a video screen. Most video poker games simulate the game of five card draw, which is the poker game most Americans are familiar with from their kitchen table experiences. The most common type of video poker is Jacks or Better. It’s called Jacks or Better because the machine doesn’t pay out any winnings unless your final hand is a pair of jacks or higher. Jacks or Better doesn’t have any wild cards, and the pay tables for Jacks or Better games are pretty consistent. I’ll write another article which will outline the exact pay tables for various Jacks or Better games, but the main thing a video poker beginner needs to know about Jacks or Better pay tables is that the casino’s vary the payouts for the flush and the straight. The best Jacks or Better game is called a 9/6 game, or “full pay” game. That means that a flush pays out at 9 to 1 and a straight pays out at 6 to 1. So if you bet $1 on that game, and you wound up with a flush, you’d see a $9 payout. Full pay Jacks or Better isn’t that common though. And that’s too bad, because if you play full pay Jacks or Better with perfect strategy, the payback percentage on the game is a whopping 99.54%. That’s almost a break-even game. Add in 0.3% or 0.4% in rewards for being a member of the slots club, and you’re talking free gambling entertainment. You’ll find a lot more 8/5 and 7/5 Jacks or Better games though, and as you might expect, the payback percentages for those types of Jacks or Better games are significantly lower. An 8/5 Jacks or Better game offers a payback percentage of around 97.3%, which is a full 2% lower than the full pay machine. The second most common type of video poker is Deuces Wild. It’s played just like Jacks or Better, but with one exception. You’ll probably be able to guess what that exception is, but I’ll explain it anyway. The payout tables for Deuces Wild are all over the place, but some Deuces Wild games offer payback percentages of over 100%, IF you play with perfect strategy. Other varieties of Deuces Wild are called “not so ugly” Deuces Wild, which offer payback percentages that are comparable to full pay Jacks or Better. Future articles will explore the pay tables for Deuces Wild in more detail. Suffice it to say that it’s not as simple as looking at the payouts for the flush as compared to the straight. Casinos love to vary the payouts for various hands at Deuces Wild, in order to keep savvy video poker players a little off balance. Dozens of video poker games and game variations exist. Most of them are based on five card draw, but some of them have different rules. Tens or Better is one example of a video poker variation that’s similar to Jacks or Better, and the name makes it clear what the difference is. Pickem Poker is another popular video poker game, and it’s actually one of the rare video poker games that isn’t based on five card draw. Some video poker games even have really cool names, like Ace Invaders. Bob Dancer publishes a series of strategy guides for various video poker games. I own every one of them, and I also own all of the strategy cards that he publishes. If you’re serious about video poker, then his products are well worth the investment. Jean Scott takes an approach to writing about gambling that I try to emulate. She focuses on getting the most entertainment for your gambling dollar. Video poker is her game of choice. She’s a great writer, and any book written by Jean Scott that you buy is well worth the investment. I have plans to expand this section of the site with detailed video poker strategy information, but with any luck, the vague outlines above will get you started on the right path.